Lloyd of Gamebooks: My Advanced Fighting Fantasy 2 adventures or: How it feels nice to get things out of your head. 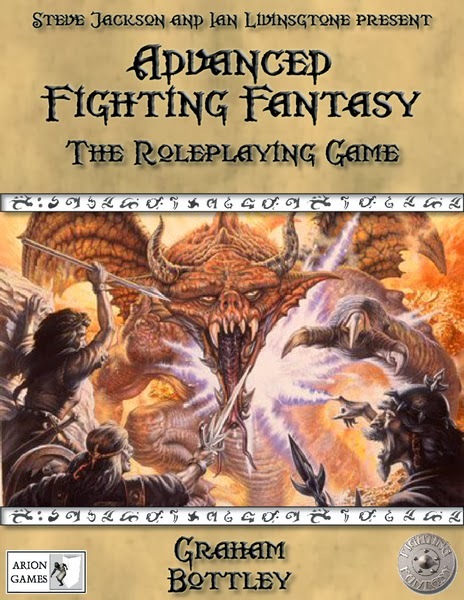 My Advanced Fighting Fantasy 2 adventures or: How it feels nice to get things out of your head. Good day to you all, gamebookers! I hope you had a lovely Christmas and that you are enjoying that weird but nice time of the year between the excesses of Christmas and the excesses of New Year. Nothing really happens in terms of work, people are usually away and it's just quiet and lets you wind down from Christmas and then prepare for New Year. Anyway, today, I want to tell you about my Advanced Fighting Fantasy 2nd Edition adventures that I have been writing recently. There are three of them, and they are all based on ideas that I have had for a while, which have been in my head, occasionally shouting out to be written down. I decided that I would deal with them once and for all and write them down. Now that I have , I feel a lot better, as if some space has finally been cleared in my head. Of course, it is not quite as simple as that, however, as while I was thinking about these scenarios, I came up with more ideas for sequels. It seems that ides beget ideas. At some point, I will write those down too, but for the moment, I can enjoy a brief moment to relax. Here is a summary of the three scenarios, along with where I got the ideas from. I have not given away any plot twists just in case future players are reading. No big plot twists here. An orc warlord has been causing trouble in the area, and, for a short time, he is not surrounded by his massive army. You have to take the opportunity to go into the dungeon and kill him. I got this idea from the Advanced Heroquest Rulebook which was an idea for a dungeon. I ran this on the official Fighting Fantasy forums a few years back. However, the thread has been lost since the forum was swamped with spam about wedding dresses. 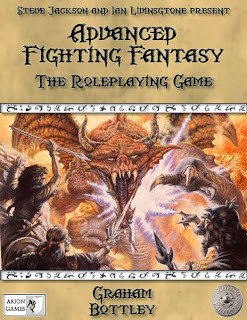 It used basic Fighting Fantasy rules, but each player had a class to choose from (the full rules are here). When I ran it, it took longer than I expected, so this version is considerably shorter as I have cut out all the 'fluff'. I have had this idea floating around for almost two decades. It started with the villains (as do most of my stories). As with most children of the 80s, Star Wars had left an indelible mark in my brain. My villains were going to be a powerful black robed wizard and a magical black knight. The campaign (or what I imagined would happen) would eventually build up to a massive battle, involving the bad guys using a Flying Castle and the heroes attacking it with their own flying ships that fired crystal missiles enchanted with the explode spell and also had crystal cannons that fired lightning bolts. My idea was that the massive amounts of money could be made to fund all this by becoming powerful enough wizards to create a pouch of infinite gold pieces (there was one in fighting Fantasy: The Introductory Role Playing Game - you find a pouch with a gold piece in. If you take it out, 15 minutes later, another one appears and so on) and then hanging them off the ceiling in a cavern, so when they make a gold piece, it falls out and so another one could appear 15 minutes later, thus having a huge cavern where it literally rained gold pieces. Why don't you propose for publishing in Fighting Fantazine? I get to play too, right?